An electron microscope image of the perforated membrane with the crystal cavity in the middle. Detail: the crystal cavity which captures light. Use your smartphone to check how clean the air is, whether food is fresh or a lump is malignant. This has all come a step closer thanks to a new spectrometer that is so small it can be incorporated easily and cheaply in a mobile phone. 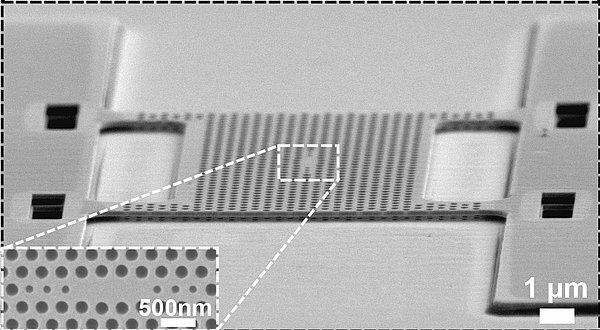 The little sensor developed at TU Eindhoven is just as precise as the normal tabletop models used in scientific labs. The researchers present their invention on 20 December in the journal Nature Communications. Spectrometry, the analysis of visible and invisible light, has an enormous range of applications. Every material and every tissue has its own ‘footprint’ in terms of light absorption and reflection, and can thus be recognized by spectrometry. But precise spectrometers are large since they split up the light into different colors (frequencies), which are then measured separately. Just after the light is split, the beams, which have different frequencies, still overlap each other; highly precise measurements can therefore only be made some tens of centimeters after the splitting. 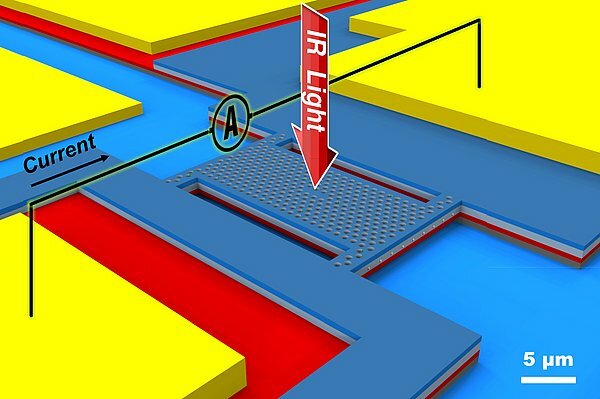 The Eindhoven researchers developed an ingenious sensor that is able to make such precise measurements in an entirely different way using a special ‘photonic crystal cavity’, a ‘trap’ of just a few micrometers into which the light falls and cannot escape. This trap is contained in a membrane, into which the captured light generates a tiny electrical current, and that is measured. PhD student Žarko Zobenica made the cavity so that it is very precise, retaining just a very tiny frequency interval and therefore measuring only light at that frequency. To be able to measure a larger frequency range, the researchers placed two of their membranes very closely one above the other. The two membranes influence each other: if the distance between them changes slightly, then the light frequency that the sensor is able to detect shifts too. For this purpose the researchers, supervised by professor Andrea Fiore and associate professor Rob van der Heijden, incorporated a MEMS (a micro-electromechanical system). This electromechanical mechanism allows the distance between the membranes to be varied, and thereby the measured frequency. Ultimately, then, the sensor covers a wavelength range of around thirty nanometers, within which the spectrometer can discern some hundred thousand frequencies, which is exceptionally precise. This is made possible by the fact that the researchers are able to precisely determine the distance between the membranes to just a few tens femtometers (10-15 meters). The structure of the device. The blue perforated plane is the upper membrane with the photonic crystal cavity in it, which captures light of a very specific frequency. When this happens it generates a current that is measured (A). To demonstrate the usefulness, the research team demonstrated several applications, including a gas sensor. They also made an extremely precise motion sensor by making clever use of the fact that the detected frequency changes whenever the two membranes move in relation to each other. Professor Fiore expects it will take another five years or more before the new spectrometer actually gets into a smartphone because the frequency range covered is currently still too small. At the moment, the sensor covers just a few percent of the most common spectrum, the near-infrared. So his group will be working on extending the detectable spectrum. They will also be integrating an extra element with the micro-spectrometer: a light source, which will make the sensor independent of external sources. Given the enormous breadth of applications, micro-spectrometers are expected to eventually become just as important an element of the smartphone as the camera. For example, to measure CO2, detect smoke, determine what medicine you have, measure the freshness of food, the level of your blood sugar, and so on.